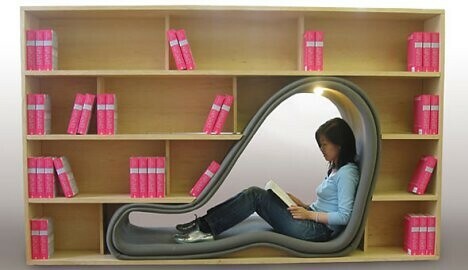 Cave Bookcase by Sakura Adachi - I love this idea and image. It does look like a cave in a bookcase--not that it looks that comfortable, but it's a visually jarring image because the smooth curves interrupt the straight vertical and horizontal lines. Sakura Adachi has designed a winner cave bookcase...expensive...but a winner.